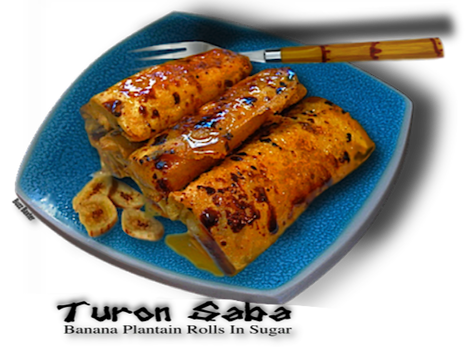 Deep fried banana and jackfruit rolled up in a spring roll wrapper and dredged with caramelized sugar..
Turon is the Tagalong name given to this simple and delicious dessert. Whether you eat it plain, with ice cream or chocolate sauce, it is sure to satisfy a "sweet tooth". 1. Cut banana in half, and cut each half into 3 pieces. 2. Lightly roll  each banana piece in sugar. roll into shape of egg roll. Seal the ends with water or egg white. 5. Remove from pan and set on waxed paper for a couple of minutes and then enjoy! Sesame seeds (if desired) maybe sprinkled while turon is still hot and the sugar has not set. Served with ice cream for dessert or just as is for snack!